The world of wine enjoyment is rife with differences of opinion. Most opinions are fun to discuss…preferences of flavors and great recipes to match, or which wine is fantastic or what wineries are worth visiting. Much more controversial is the decision of what closure best keeps the wines safe in the bottle. Traditionalists and purists often insist that wine be closed with natural cork. This tried-and-true method has sealed bottles, however tenuously, for centuries. Removing the cork is celebratory in nature, with a tell tale exhuberant “pop” which marks the beginning, or continuation, of any occasion. Unfortunately, natural cork has two very significant issues… first, a special tool is needed to extract the cork. Second, at least 5% of all bottles sealed with natural cork are damaged by the cork itself. Apart from wine, I can think of no product where we would consider these defects acceptable. For this reason, at Salut! Wine Co. we encourage everyone to let go of the stigma of the screwcap, and instead embrace the new technology with open arms! If there’s good wine in the bottle, we’d like it to stay that way, and not go through a great deal of effort to get to it when desired. We’ll leave the celebration and an exhuberant “ting” to the toast and enjoyment of the wine! 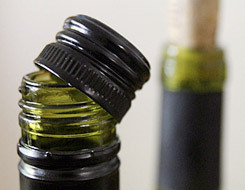 More complete information on the defects we’re speaking of are included in the wine tips here on our blog and in the articles linked at our website at http://www.salutwine.com/Information%20Pages/Cork%20vs%20Screwcap.htm.